Volume I.—NO. 1., June 1847. I. The Office of Reason in Regard to Revelation, by the Rev. J.H. Thornwell, D.D. II.. The Relation between the Work of Christ and the Condition of the Angelic World, by the Rev. Rev. Benjamin Morgan Palmer, D.D. Volume I.—NO. 2., September 1847. Volume I.—NO. 3., December 1847. Volume I.—NO. 4., March 1848. III. The Moral Condition of Western Africa, by the Rev. John Leighton Wilson, of S.C.
Volume II.—NO. 1., June 1848. II. A Brief Inquiry into the Nature of Jephthah’s Vow, by the Rev. W.M. Smythe, A.M.
Volume II.—NO. 2., September 1848. I. The Call to the Ministry—Its Nature and Evidence, by the Rev. Thomas Smyth, D.D. VII. John the Baptist, the Unitarian Jesus, by the Rev. Thomas Curtis, D.D. VIII. The Power of the Pulpit, by the Rev. Abner A. Porter, D.D. Volume II.—NO. 3., December 1848. I. Some Thoughts on the Development of the Presbyterian Church in the U.S.A., by the Rev. Robert J. Breckinridge, D.D. II. The Office of Deacon, by the Rev. Thomas Smythe, D.D. Volume II.—NO. 4., March 1849. V. Romans, 9th Chapter, I-V Verses, by Rev. S.L. Graham, D.D. Volume III.—NO. 1., July 1849. I. Denominational Education, by the Rev. Robert J. Breckinridge, D.D. II. The Pelagian Controversy, by the Rev. Enoch Pond, D.D. IV. The Lives of the Lord Chancellors and Keepers of the Great Seal in England, by the Rev. Thomas Curtis, D.D. VI. The Unity of the Race, by the Rev. George Howe, D.D. Volume III.—NO. 2., October 1849. IV. Ethnography, by the Rev. George Howe, D.D. V. The Philosophy of Religion, by the Rev. J.H. Thornwell, D.D. Volume III.—NO. 3., January 1850. I. North and South, by the Rev. Abner A. Porter, D.D. Volume III.—NO. 4., April 1850. Volume IV.—NO. 1., July 1850. Volume IV.—NO. 2., October 1850. Volume IV.—NO. 3., January 1851. I. Education, Inaugural Address, delivered by Thomas Curtis, D.D. II. Objections to the German Transcendental Philosophy, by Enoch Pond, D.D. Volume IV.—NO. 4., April 1851. II. Matthew xxiii. 29, by the Rev. James Henley Thornwell, D.D. Volume V.—NO. 1., July 1851. V. The Harmony of Revelation and Natural Science, Part I, by the Rev. L.W. Green, D.D. Volume V.—NO. 2., October 1851. VI. The Harmony of Revelation and Natural Science, Part II, by the Rev. L.W. Green, D.D. VII. 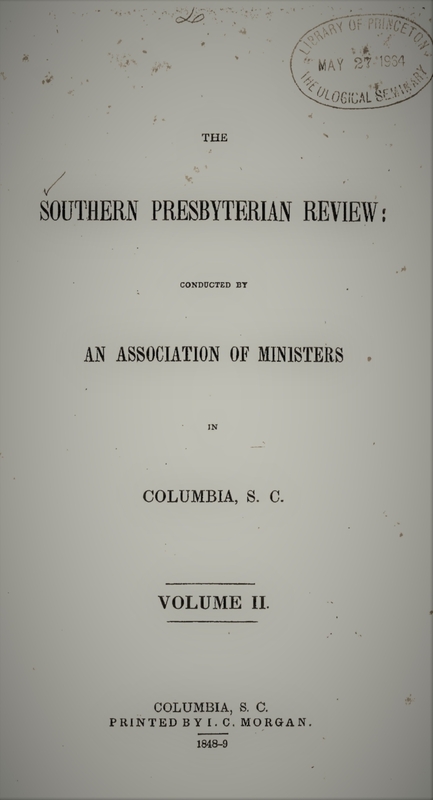 Correspondence regarding the Palmetto Regiment, by the Rev. Thomas Curtis, et al. Volume V.—NO. 3., January 1852. Volume V.—NO. 4., April 1852. I. The Harmony of Revelation and Natural Science, Part III, by the Rev. L.W. Green, D.D. Volume VI.-NO. 1., July 1852. I. Spiritual Beneficence, by the Rev. Enoch Pond, D.D. Volume VI.-NO. 2., October 1852. Volume VI.-NO. 3., January 1853. Volume VI.-NO. 4., April 1853. VII. Mormonism, by the Rev. Benjamin M. Palmer, D.D. Volume VII.—NO. 1., July 1853. Volume VII.—NO. 2., October 1853. II. Action and Reaction of Mind and Body, as affecting Insanity, by James McFadden Gaston, M.D. Volume VII.—NO. 3., January 1854. Volume VII.—NO. 4., April 1854.